吴萌岭, 祝露, 田春. 重载列车电控空气制动系统纵向冲动影响分析[J]. 同济大学学报(自然科学版), 2018, 46(7): 964-971. 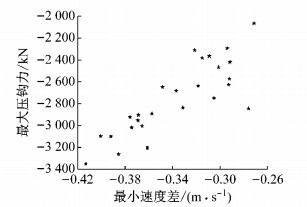 DOI: 10.11908/j.issn.0253-374x.2018.07.015. 摘要：应用电控空气(ECP)制动系统与纵向动力学联合仿真系统研究制动初速度、车钩间隙以及坡道坡度等对列车纵向冲动的影响规律，并分析纵向冲动与车辆速度差之间的内在联系.结果表明：制动初速度对列车纵向冲动无明显影响，而坡道坡度影响最显著，其次是车钩间隙；列车最危险的制动位置是列车前3/8处于坡道上、其余在平直道上，并且该制动位置不随制动初速度、坡道坡度以及车钩间隙的变化而变化；当压(拉)钩力超过2 000 kN时，最大压(拉)钩力与该车钩所对应的最小(大)速度差呈线性相关；一阶滤波后的速度差控制在-0.25~0.25 m·s-1时最大压(拉)钩力大于2 000 kN的概率不足5%. Abstract: The simulation model of electronically controlled pneumatic (ECP) braking system and longitudinal dynamics was built to analyze the influence of initial braking speed, coupler slack and gradient on train longitudinal impulse. The results show that: initial braking speed has no effect on the longitudinal impulse while the gradient affects the longitudinal impulse most, followed by coupler slack; the top 3/8 of train at the ramp-flat change point is the most dangerous braking position, and this position cannot be changed with the initial braking speed/coupler slack/gradient; when the pressed (tensile) coupler force exceeds 2 000 kN, the maximum value has linear correlation with the minimum (maximum) velocity difference; when the filtered velocity difference is controlled with a range of -0.25~0.25 m·s-1, the possibility that the maximum pressed (tensile) coupler force exceeds 2 000 kN is less than 5%. 由于机车与货车的基础制动参数不一致，所以制动缸目标压强也有所差异.实施最小常用制动时，目标压力均为42 KPa，此时机车制动缸在0.9 s后稳定在40 KPa，而货车均在1.6 s后稳定在39.5 KPa左右(图 3a).实施最大常用全制动时，机车和货车的目标压力分别为406和252 KPa，而仿真结果(图 3b)显示两者分别在9.7和8.8 s后稳定在402和248 KPa附近；缓解后，两者制动缸压强分别需10.3和12.4 s后降至40 KPa以下.施行紧急制动时，机车与货车制动缸目标压力分别为487和302 KPa，而实际(图 3c)中机车和货车分别在11.6和10.3 s后稳定在482和298 KPa左右.进一步研究发现，第1、11以及21节货车的制动缓解响应基本是一致的，这是因为：列车管直接向副风缸供风，此时可将副风缸视为恒压源. 假设重载列车车钩间隙均为5 mm，列车以120 km·h-1的初速度在不同坡道形式和坡度上实施紧急制动，仿真分析不同工况下列车车钩力的变化.本文研究以下两种典型的坡道形式，分别是“平道+上坡”(图 4a)和“平道+下坡”(图 4b). 由图 6可知，上坡道对列车压钩力影响较大，最大可达-3 375 kN；下坡道对列车拉钩力影响较大，最大达到3 098 kN.这是因为：在上坡道时，坡道上车辆的运动减速度比平直道上的大，此时车钩呈压缩状态，因此上坡道对压钩力影响较大；反之亦然. 纵向冲动主要通过车钩力反映，而车钩力又是由相邻两车运动状态的不一致引起的.一般地，车辆运动状态可以通过加速度、速度以及位移等参数表征，但是在工程应用中多监测速度信号，这是因为：位移传感器价格贵，加速度传感器易受外界噪音干扰而影响测量精度.同时根据TB/T 1335—1996《铁道车辆强度设计及鉴定规范》可知：通用货车缓冲器最大阻抗力不大于2×103 kN，容量不小于45 kJ.因此，本文主要研究相邻两车的速度差与2×103 kN以上的车钩力之间的内在联系. 如图 8所示，当最大压钩力大于2×103 kN时，此时车钩对应的最小速度差均小于-0.26 m·s-1.仔细观察还可发现，最大压钩力与最小速度差之间呈正向线性相关，即：车钩力越小，该车钩所对应的最小速度差越小.为了进一步说明问题，本文模拟列车在“平直道+上坡道”的不同坡度上，以不同车钩间隙和不同制动初速度实施紧急制动，研究2×103 kN以上压钩力所对应的最小速度差的分布情况，如图 9所示. 由图 9知，最大压钩力与最小速度差之间呈正态分布，并且服从N(-0.315, 0.001 3).2×103 kN以上压钩力所对应的最小速度差分布在-0.45~-0.2 m·s-1之间，当最小速度差大于-0.25 m·s-1时，最大压钩力大于2×103 kN的概率为3.52%. 通过分析可知，最大拉钩力与最大速度差之间也呈正态分布，服从N(0.349, 0.0025).其中，最大速度差均分布在0.2~0.5 m·s-1之间，当最大速度差小于0.25 m·s-1时，最大拉钩力大于2×103 kN的概率为2.32%. (4) 最大压(拉)钩力大于2×103 kN的车钩所对应的最小(大)速度差呈正态分布，且经滤波后的速度差控制在-0.25~0.25 m·s-1之间时，车钩力超过2×103 kN的概率不足5%. 张波, 钱立新, 马大炜, 等. 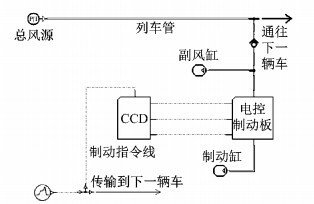 重载列车ECP_DP系统的仿真研究[C]//铁道科学技术新进展——铁道科学研究院五十五周年论文集. 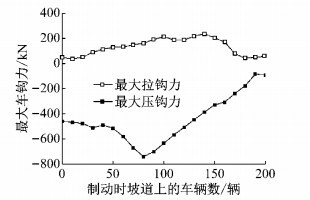 北京: 铁道科学研究院铁道技术研究发展中心, 2005: 142-152. ZHANG Bo, QIAN Lixin, MA Dawei, et al. Simulation study on ECP system for heavy haul train[C]//New Progress of Railway Science and Technology, Proceedings of the Academy of Railway Science. Beijing: Research Center of Railway Science and Technology, 2005: 142-152. Wright E C. ECP brake: Transitioning from development to deployment[C]//2001 ASME International Mechanical Engineering Congress and Exposition, New York: American Society of Mechanical Engineers, Rail Transportation, 2001: 129-134. HUANG Zhiwu, QU Xiaohui, LIU Weirong, et al. A high efficient and reliable DC-DC converter for Electronically Controlled Pneumatic brake system applications[C]//40th Annual Conference of the IEEE Industrial Electronics Society. Dallas: IEEE, 2014: 5012-5018. 陆强. 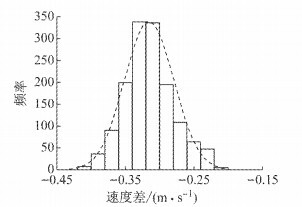 重载列车ECP制动系统方案设计及仿真研究[D]. 成都: 西南交通大学, 2009. LU Qiang. Design solution and simulation research of ECP brake system for heavy haul train[D]. Chengdu: Southwest Jiaotong University, 2009. 杨润栋、王祯、刘继功, 等. 列车牵引计算规程: TB/T 1407—1998[S]. 北京: 中华人民共和国铁道部, 1983. YANG Rundong, WANG Zhen, LIU Jigong, et al. Regulations on railway train traction calculation: TB/T 1407—1998[S]. Beijing: Ministry of Railway of the People's Republic of China, 1983. 姚寿文. 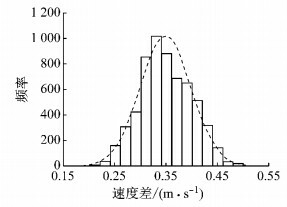 长大货物列车电控空气制动系统及防滑器的智能控制研究[D]. 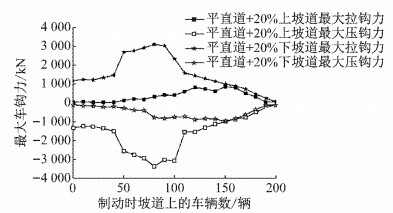 北京: 铁道部科学研究院, 2006. YAO Shouwen. 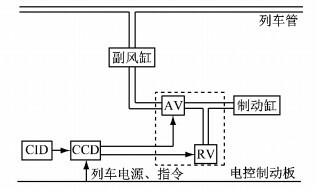 Research on intelligent control of ECP brake system for long heavy haul freight train and anti-skid system for passenger train[D]. Beijing: China Academy of Railway Sciences, 2006. The Association of American Railroads. Manual of standards and recommended practices: AAR S—4200[S]. Washington: The Association of American Railroads, 2007. 赵连刚. 基于制动系统仿真的两万吨列车纵向动力学分析[D]. 大连: 大连交通大学, 2008. ZHAO Liangang. Combined simulation of air brake system and longitudinal dynamic of 2 000 t Train[D]. Dalian: Dalian Jiaotong University, 2008. 洪原山, 周晓峰, 成建民, 等. 铁道车辆强度设计及鉴定规范: TB/T 1335—1996[S]. 北京: 中华人民共和国铁道部, 1996. HONG Yuanshan, ZHOU Xiaofeng, CHENG Jianmin, et al. Code for strength design and test evaluation of railway rolling stock: TB/T 1335—1996[S]. Beijing: Ministry of Railway of the People's Republic of China, 1983.